Japan Airlines' selection of the A350 is a welcome win for Airbus in a strongly Boeing-flavoured Japanese aircraft fleet. It is also consistent with JAL's strategy to use smaller widebody aircraft as Japanese demand weakens and global competition works even more against JAL's high cost base – one of the highest in Asia. It was not long ago that JAL operated the world's largest fleet of 747s. JAL's 2010 bankruptcy restructure saw all 747s retired, but the process also introduced a mindset change at JAL that it could no longer be the behemoth it once was. That has been accompanied with practicality of how many passengers JAL can reasonably expect to carry. The A350 JAL has ordered is a slight downward revision of capacity from JAL's 777-300ER long-haul backbone. While Asian peers Asiana and Cathay Pacific have also ordered the A350, it will not be the largest type in their fleet whereas JAL's current order sets the A350 to be JAL's largest long-haul aircraft, complementing the medium-sized 787. The 07-Oct-2013 order for 31 A350s comprises 18 A350-900s and 13 A350-1000s, plus 25 options. This is the first time JAL has ordered aircraft directly from Airbus, excluding Japan Air System's Airbus orders JAL took on when it acquired the former domestic operator (they have since been withdrawn from JAL's fleet). This is also Airbus' first order from one of Japan's two major airlines who jointly account for nearly 75% of Japan's domestic market and a quarter of its international market. Boeing had maintained a tight grip on ANA and JAL, partially due to government and economic pressures, such as the substantial role in manufacturing Boeing aircraft parts. The A350-900 is a rival to the 777-200 family, both for regional and long-haul missions. JAL has 26 of those (with none on order) and has ordered 18 A350-900s. Some 777-200ERs are being replaced by 787s. For example, in Dec-2013 a 787 will take over the 777-200ER on the Tokyo Narita-Sydney route. The A350-1000 is a rival to the 777-300ER. JAL has 13 A350-1000s on order and, not coincidentally, 13 777-300ERs in service with none on order. The A350-900 and A350-1000 will be more efficient than the 777-200 and 777-300ER they will likely replace. One notable distinction is that the A350s are slightly smaller than the 777 versions. JAL has been down-gauging its fleet, first shedding 747s (at its peak, JAL operated over 80 747s) and is currently in the process of decreasing the number of large widebody aircraft in favour of mid-sized aircraft like the 787. The A350s will fulfil that objective. The A350-1000 will likely be used on major long-haul routes where JAL's 777-300ERs currently fly (Tokyo Narita to Chicago, Frankfurt, Los Angeles, London Heathrow, New York JFK and Paris CDG). A350-900s can replace 777-200s on regional routes like Tokyo Haneda-Hong Kong and 777-200ER routes like Tokyo Narita-Honolulu, although JAL is decreasing the long-haul routes for the 777-200ER, preferring to use either the 787 or 777-300ER. JAL has replaced the 777-200ER once used on Narita-Moscow with a 787. JAL evaluated the A350 against the 777X, the planned successor for the 777. The 777X is overall larger than the existing 777 models it will replace. Its entry into service is also further away (next decade) and none has yet been built, unlike the A350, which has already flown. JAL expects its first A350 in 2019 and for delivery to be completed over six years. By 2019 JAL's 777-200ERs will be 14-17 years old and its 777-300ERs 10-17 years old, according to CAPA's fleet database. This is suitable retirement age and, if anything, above the typical retirement age for Asian airlines, which prefer young fleets. JAL's future widebody fleet will likely be comprised of the initial 31 A350s plus the 45 787s in service or on order. The 787s will mainly be used on thinner routes and the A350s on major ones. 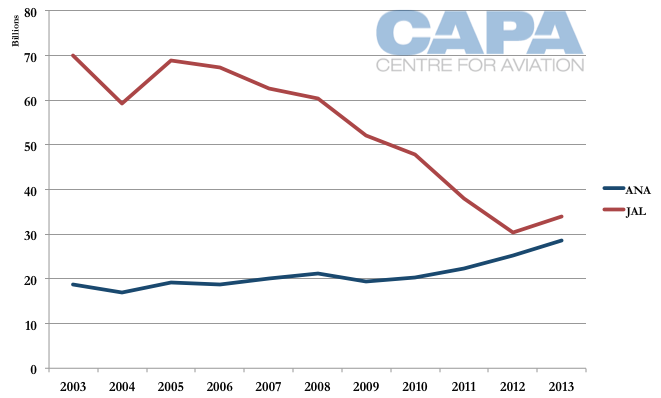 The reason to move to smaller aircraft is largely due to two factors. First, Japan's population is declining, which will dampen travel demand. Economic reforms will take some time to materialise, but are not expected to restore Japan to its previous highs. So this limits point-to-point traffic JAL can carry to/from Japan. Other airlines when faced with a small local market – Emirates, KLM, Singapore Airlines – have turned to relying on transfer traffic, using their hub as a mid point. But the successful execution of this is dependent partially on having a low cost base. JAL's cost base was decreased during its bankruptcy re-structuring, and its cost is lower than rival ANA. 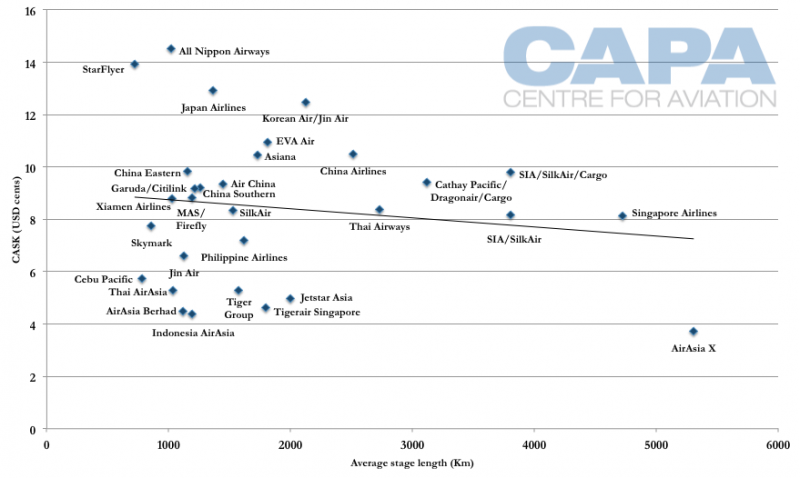 But JAL still has one of the most expensive cost bases in Asia – and the world, according to CAPA's CASK ranking in Asia. Coinciding with the fleet cuts, JAL's international traffic has substantially reduced to half (35 billion RPKs in the year ending 31-Mar-2013) of peaks in recent history: 70 billion RPKs in the years ending 31-Mar-2003 and 31-Mar-2005. JAL's cuts and ANA's growth means the two – once distant competitors – are separated by only about 5.5 billion RPKs. ANA and JAL rely predominantly on Boeing aircraft. All of JAL's mainline (excluding affiliates and subsidiaries) aircraft are from Boeing while for ANA the figure is 91% (17 A320s comprise the remaining share). The next closest major airlines largely relying on a single manufacturer are Lufthansa (81% Airbus) and US Airways (79% Airbus). These figures only compare aircraft numbers and not their seat capacity or value. Cathay Pacific for example is evenly split between Airbus and Boeing, but its Boeing aircraft have more seats and range than most of its Airbus aircraft. Almost half of Air Canada's fleet is comprised of Airbus aircraft, but these are mainly narrowbodies. Boeing has a 25% share, all of which are widebodies. Of the 629 A350s on order (prior to JAL's order), 225 – 36% – are from Asian airlines. The largest customers in the region are Singapore Airlines (70) and Cathay Pacific (48). JAL's order fulfils Airbus' long held wish to secure a blue-chip presence in Japan and this order will be seen as a significant breakthrough in the market. While Airbus has aircraft in Japan – 66, according to CAPA's fleet database – it did not take the existing aircraft to be significant. AirAsia Japan and Jetstar Japan were using the aircraft type of their foreign parents. Airbus did not see local Peach, Skymark or Starflyer as key customers, although it was grateful for their business. The upshot is that on the one hand JAL has received exceptional value on aircraft that accord within its strategic vision and on the other Airbus has broken into territory that has for so long evaded it. For Boeing the purchase, although unwelcome, will not come as a great surprise, after maintaining such a powerful hold on a key world market for so long. From an overall airline perspective too, it is another example of the value of having a level of competition in the airframe market, where numerous aircraft sizes and performances are possible. In today's much more competitive environment, the concept of a one size fits all-747 fleet is very much a thing of the past.